He, he, all this nonsense has a reason. Nope, I’m not getting nuts, it’s only that I did make a Cod Connection with Mel from BouchonFor2. Want to know all about it? Melody has this wonderful blog and these days she is travelling through Europe and visiting Barcelona among other cities. She asked me if I could prepare a typical Catalan dish so that she could offer it in her blog while she wandered through my city. How could I say no? Of course, I said yes and offered her a dish not only Catalan but also from Barcelona: Bacallà a la llauna. Where Bacallà means Cod and a la llauna means in the tin pan. You can read all about it at her site. 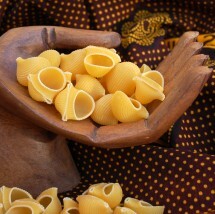 I’m just showing you one of the pictures of the recipe hereunder… simple and delicious! 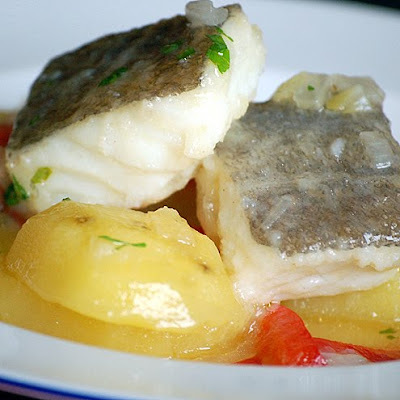 And my recipe today will also be about Cod: Guiso de Bacalao con patatas. Yes, you guessed right, I LOVE codfish! Get into the Cod Connection!!!!! 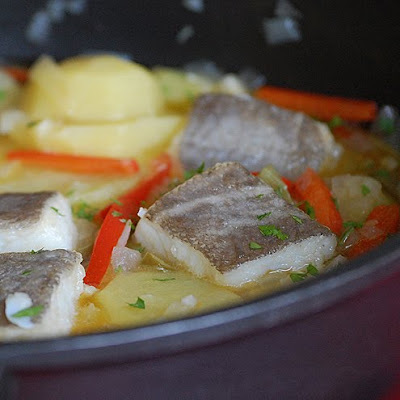 Ingredients for 4 servings: 800 grs of potatoes, 500 grs of desalted cod, 1 red pepper, 1 green pepper, 1 onion, 3 garlic cloves, some flour, 3/4 of a liter of fish stock, 2 small red chillies, extra virgin olive oil, salt and parsley. Chop the onion and the peppers and place inside a sauce pan with just a bit of olive oil. Turn heat on and cook at low/medium temperature until the veggies get some colour. Peel the potatoes and cut in slices or dices. Reserve. Add the chillies to the sauce pan. Stir and add the potatoes. Pour the stock in and cook for aproximately 20 minutes. Coat the cod in flour and fry in a different pan with extra virgin olive oil. 30 seconds per side only. 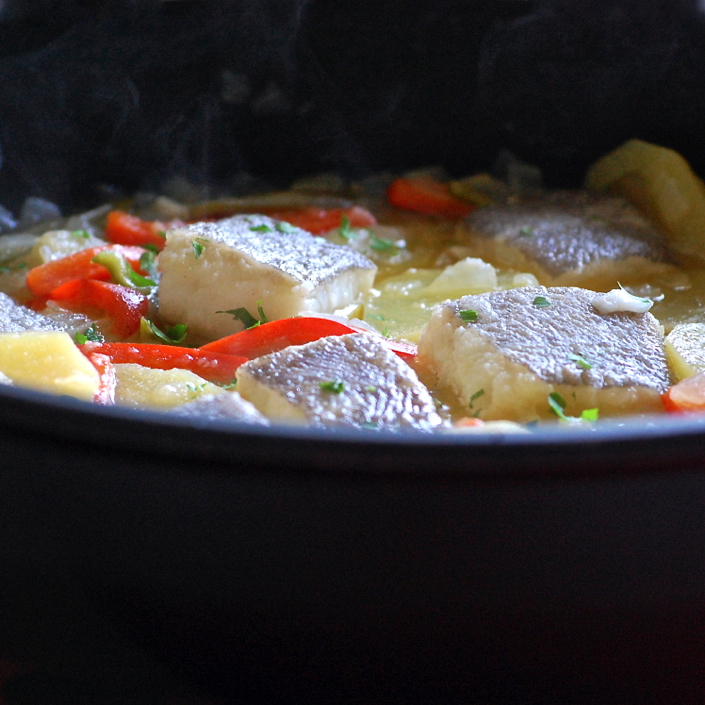 Place the cod with the potatoes with the skin on top and simmer for 5 minutes. Take away the chillies. Mince some fresh parsley leaves and sprinkle on top. Serve hot. Since the cod keeps a bit of its salty previous treatment, it normally doesn't need more salt. 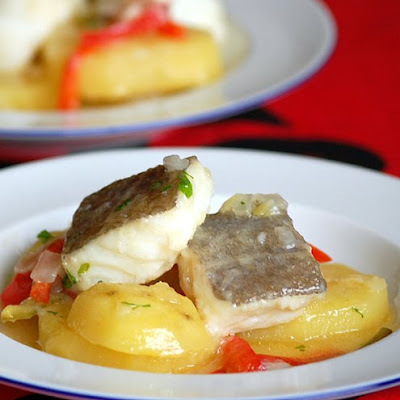 Salt cod is one of my favourite foodstuffs and this version looks absolutely delicious. However, I have recently developed ethical issues about eating cod, as the cod population has almost diminished in some places due to overfishing. Qué rico, qué buena pinta… ñam. Jaja, Mel ha pedido a medio mundo un guest post, a mí también. Besos! Looks wonderful Nuria…I like eating cod in its various forms. The movie you propose sounds hilarious! I like it salted, then desalted. I have 3 favorite ways to eat bacalao (1) in Empanada Gallega (codfish pie) (2) Bacalhau a Gomes de Sa (Brazilian casserole with potatoes and onions) and (3) Puerto Rican ensalada de bacalao with plantains, olives and avocado. I feel like eating all 3 right now! I love cod as well, probably my favorite fish. This dish sounds great. This is very similar to a Newfoundland dish where salt cod is quite popular as well. Makes sense since the Grand Banks were fished by Europeans as well.No need to hide this in the back room. Oh bacalao! Your posts always put me in such a great mood my friend. And this dish, so delicious. I love cod. Fish never looked better. That last, reddened photo of the cod has me wanting fish for breakfast. This is similar to how we do our Cod here in the Caribbean. This cod preparation sounds amazing and your photos are incredible! oh Nuria, I ate this exact dish for lunch in Calella de Palafrugell in June 2005, and it was awesome! i mean, really fabulous. it was even dressed with some incredibly fruity olive oil from Roses and some really oniony chives. Then we walked the ronda to llafranc before spending the night in Girona. I must, must, must make this. so many good memories, all of them delicious. Nuria, What a wonderful dish! Besitos! 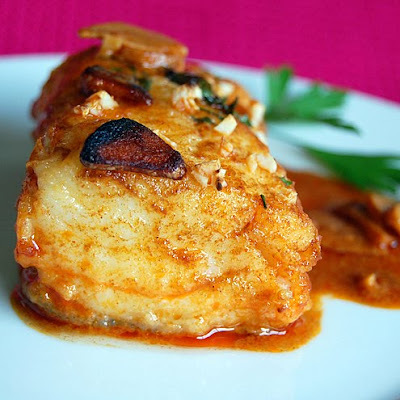 i love cod I have posted lmny recipes on my blog and you recipe just looks delicious ! Oh those cod dishes are to die for! Bakalaos is one of my favourite fish. Yours looks yummy and your photos beautiful as always. < Snails with Bacon and Mushrooms. A Fall’s tapa!